In previous article, we've talked about ".NET Core On Mac - Building An ASP.NET Core App With Web API, EF, PostgreSQL And Running It On Docker". The article was using .NET Core 1.1 version and If you've been following the same steps mentioned from the article using .NET Core/ ASP.NET Core 2.0, then it's expected that the steps won't work anymore. Over a year, there has been some changes from .NET Core 1.x to version 2.0. 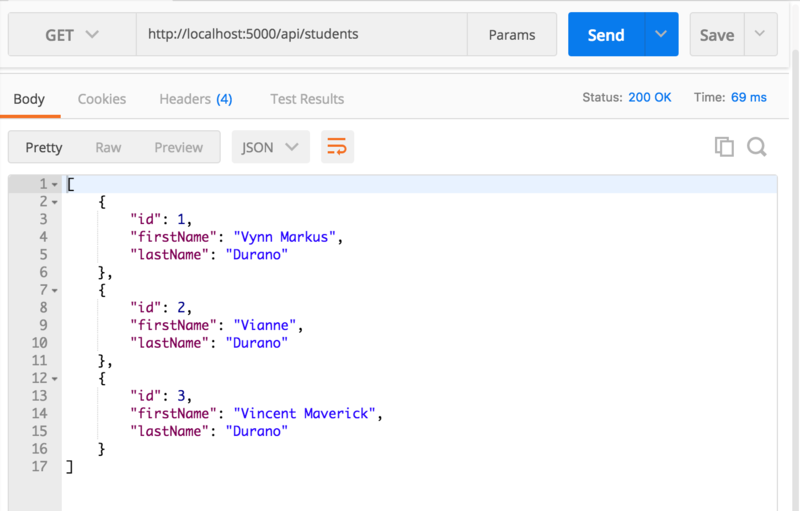 In this article, we'll explore ASP.NET Core 2.0 and Docker by building a simple Web API application and deploying it on a Docker container. Note: Before you move down further, make sure that you have a basic understanding on ASP.NET Core and Docker because I will not talk about the details about each technology in this article. 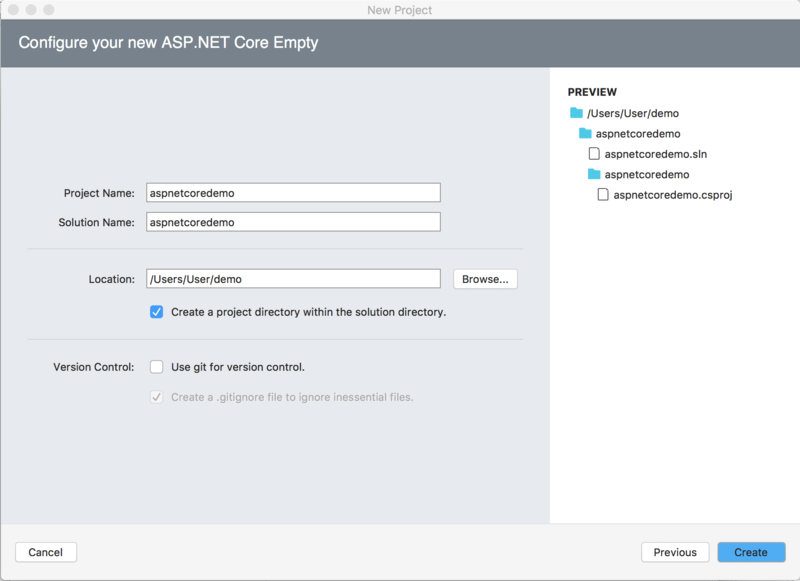 Now, fire up Visual Studio 2017 and create an empty ASP.NET Core project just like in the figure below. That's it! We now have an ASP.NET Core app running in MAC. Now, to make this demo more exciting, we will move a bit further and create a simple Web API that handles a basic CRUD operations and use Posgres as our database. We will then run our application and database inside a Docker container. 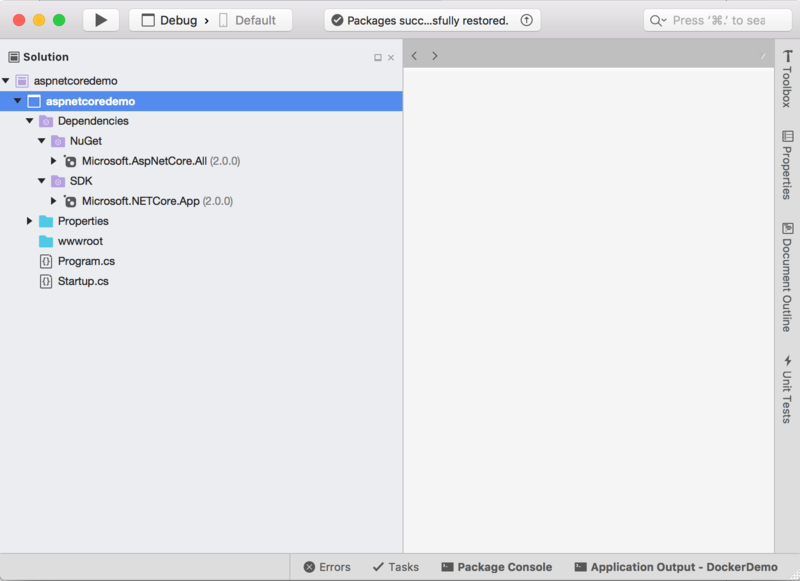 The packages above enable us to use EntityFramework Core as our data access mechanism. We'll be using EF Core to sync and update database from PosgreSql database and then use Web API to serve data requests. The -d option runs a container in the background and prints the container ID. The --name assigns a name to the container, in this case we named our container as "localdb". The -e allow us to set the environment variables, which in this case, we've set a password to "supersecret" for our Postgres image using the POSTGRES_PASSWORD variable. Running the command above will expose the postgres port 5432 which allow a standard container to be available to the linked containers. 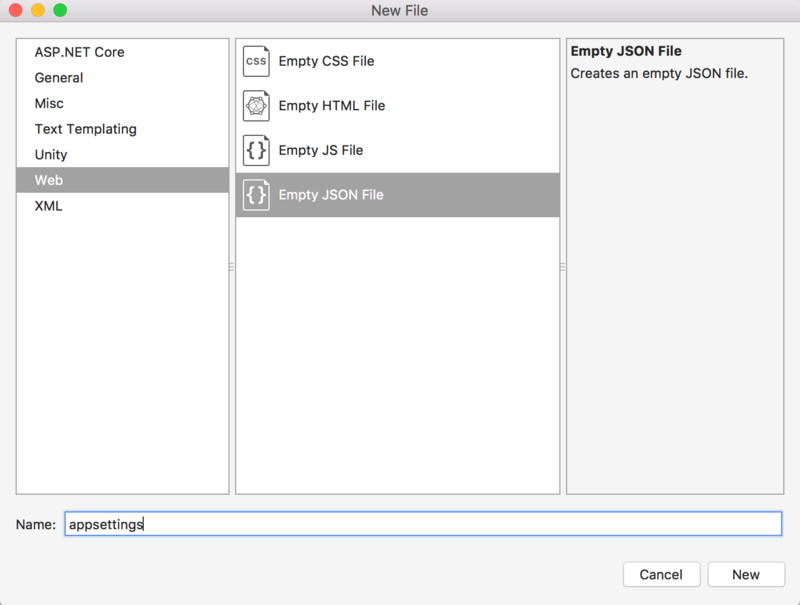 The initdb will also be generated with default user and database. Now that we have our database ready inside a docker container, it's time for us to build the application. The ConnectionsSring above will allow us to connect to the PostgreSql service container that we ran earlier. For this demo we will be using EF Code-First approach which means, we will create the Model first and then run a migration to let EF generate the database/schema based on our Model. 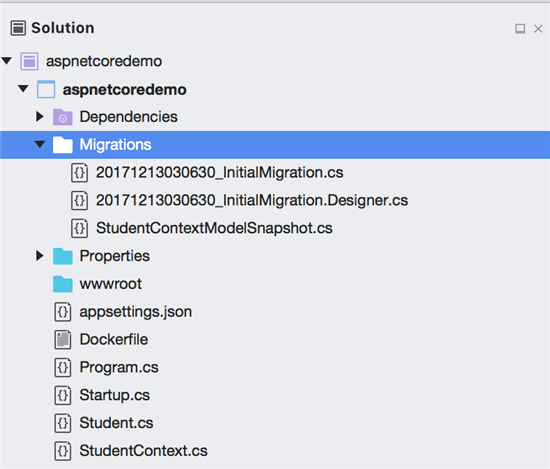 EF Core does not do the migration automatically, that's why we need the pieces of configuration above for us to use Code-First migrations. The Database.Migrate() method piece is responsible for two things: (1) The creation of database in PostgreSQL if it does not exist yet. (2) Migrating the database schemas to the latest version. 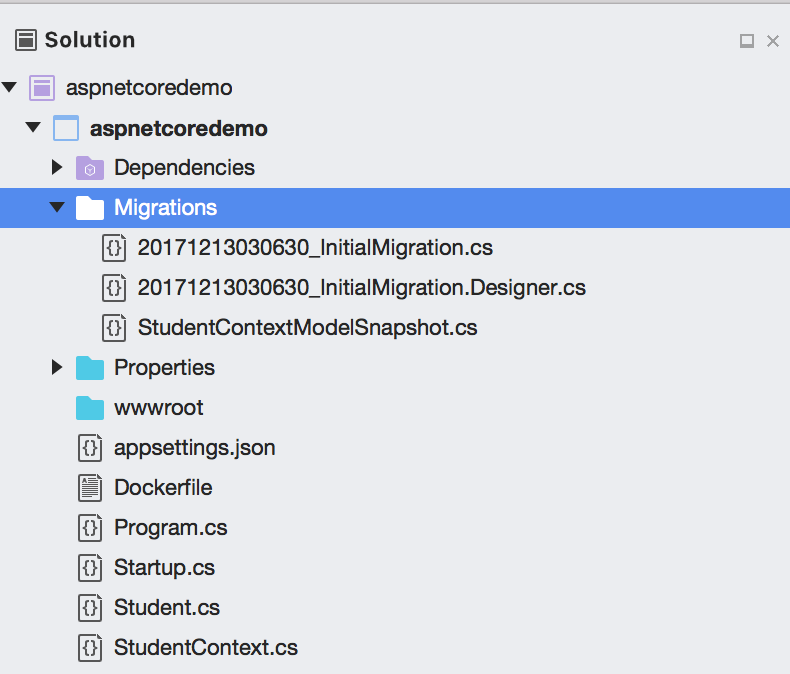 "Package 'Microsoft.EntityFrameworkCore.Tools.DotNet 2.0.0' has a package type 'DotnetCliTool' that is not supported by project"
The ef migration add is the command to add migrations. When the migration is successful, you should be able to see a new folder named "Migrations" that contains the migration files as shown in the figure below. The files generated above will be used to create the database on initial run. Nothing really fancy there, the code above just contains a few basic methods that communicates to StudentContext. 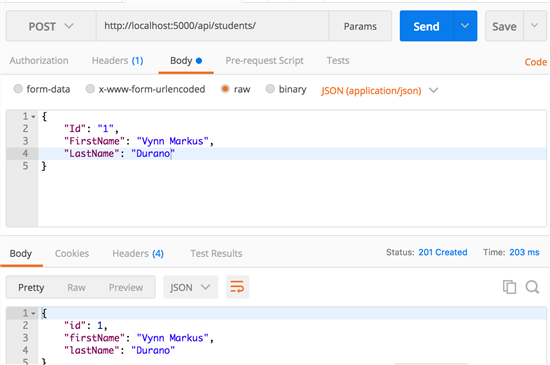 Notice that we've injected an instance of our StudentContext in the Controller's constructor, so we can interact with our database, and use the it for querying the data. $ docker build -t dockerdemo . The command above will generate a new instance of image within our docker machine. You can check the list of image by running docker images in the command line. Here are some of the screenshots of the Endpoint test results, using Postman. That's it! I hope you will find this article useful. 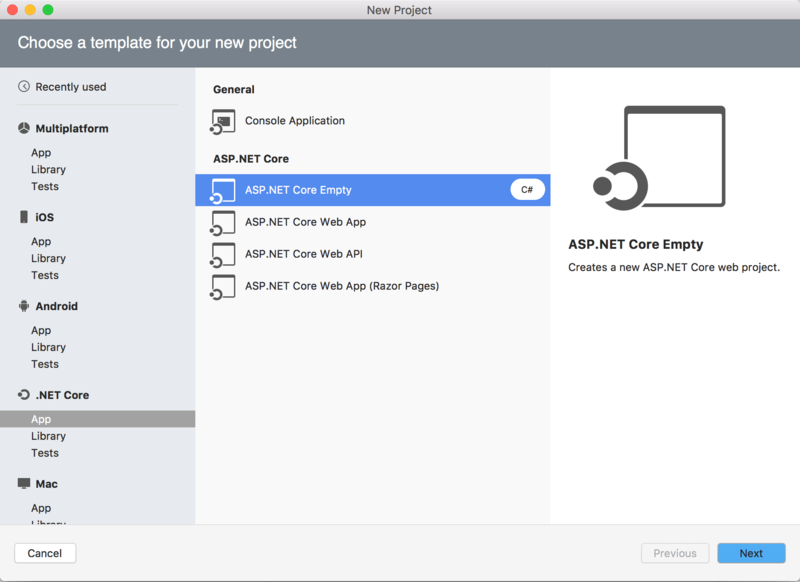 In this article, we've learned the basics on setting up .NET Core 2 on MAC environment and learned how to create a simple ASP.NET Core 2 application with Web API, EF, PostgreSQL and running it on Docker.